Step-by-step checklist for undergraduate students applying for federal, state, and institutional financial aid. Use this form to request that KU cancels financial aid. Students who are required to document their citizenship status may use this form if they are not local to the Lawrence area. The form must be notarized and submitted along with a photocopy of the student’s original citizenship document. Important financial aid information for high school juniors and seniors considering KU. Learn more about federal student loan options. Complete this form if you would like to request that Federal Work-Study be added to your financial aid package or to request an increase of an existing Federal Work-Study award. 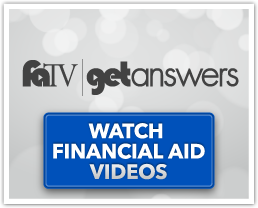 Overview of the types of financial aid, eligibility for financial aid, and important information about the rights and responsibilities of financial aid recipients. List of all financial aid programs administered by KU, including how to apply and general eligibility criteria. Use our interactive worksheet to estimate your personal cost of attendance vs. your financial aid award. NOTE: For the form worksheet to function correctly, open in Adobe. Request to have your financial need summary sent to an outside organization. Learn more about graduate / professional student loan options, repayment terms, and loan forgiveness options. Frequently asked questions/ answers regarding financial aid for students attending the KU Edwards Campus. Financial aid form for international students or undocumented students who are unable to complete the FAFSA. Students can submit this form to determine eligibility for need-based financial awards. The J.L. Cleland GLBT Non-Discrimination Scholarship was established to provide a scholarship to ultimately play a part in reducing and eliminating hatred, bullying, discrimination, bigotry and violence against gay, lesbian, bi-sexual and transgender persons. Information about a low-interest loan available only to KU students. Information about borrowing student loans in preparation for the bar exam. Information about how a non-degree seeking student might be eligible for federal financial aid. Information about special financial aid opportunities for Pharmacy students. Information sheet and checklist for parents who want to apply for a Parent Loan for Undergraduate Students (PLUS Loan). Students borrowing a private loan may be required to complete and submit this form to the private lender. This form should be filled out by the student and submitted directly to the lender. You can find the information to complete this form online in Enroll & Pay (View Financial Aid > Select Aid Year > Financial Aid Summary). Information about borrowing non-federal student loans from private lenders. Use this form to request additional loans if you are a graduate, professional, or law student. Use this form to request additional loans if you are an undergraduate student. Report scholarships you have been awarded to the Financial Aid and Scholarships (FAS) office. Helpful information for conducting a scholarship search. Information regarding how to request a Special Circumstances Re-Evaluation due to FAFSA changes or income changes. Checklist for students seeking financial aid for a study abroad program. Use this form to request financial aid for summer 2019. Use this form to request re-evaluation of your financial aid package based on having increased mandatory or non-discretionary expenses. In some cases, FAS may be able to adjust your Cost of Attendance (COA) based on these special circumstances. Adjustments to COA do not guarantee additional financial aid will be awarded. Frequently Asked Financial Aid Questions for students who are transferring to or from KU. Use this guide to understand critical steps in applying for and receiving financial aid at the graduate school level. Use this guide to understand critical steps in applying for and receiving financial aid for the KU School of Law. Use this guide to understand critical steps in applying for and receiving financial at KU. If your application is selected for verification, an email notice will be sent to your registered KU email address. Do not initiate this process unless instructed by FAS to do so. Information about how withdrawing and/or dropping classes can affect your financial aid.